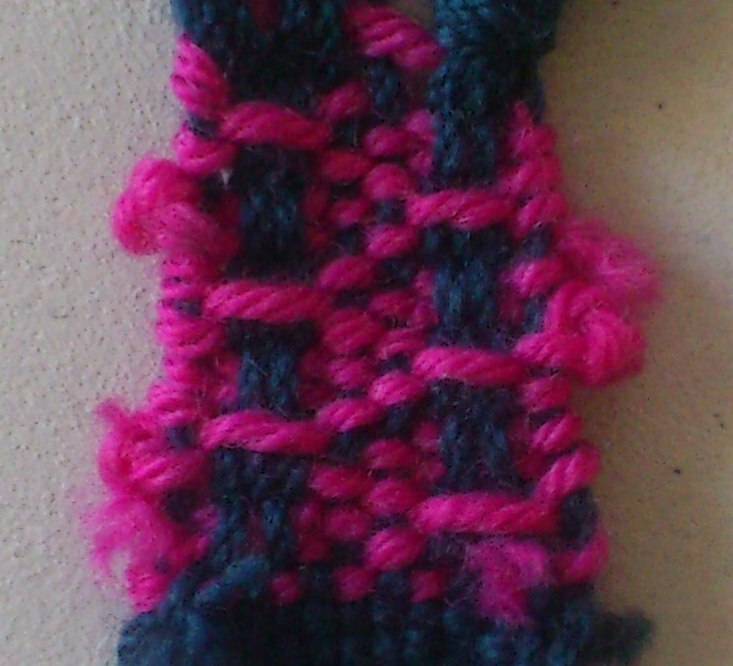 I got interested in supplementary warps almost as soon as I got weaving! 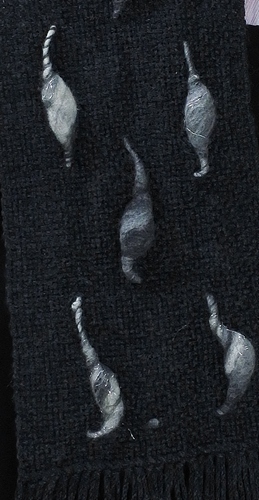 It’s such a cool way to add texture to your cloth and the possibilities are almost endless. So what is a supplementary warp? 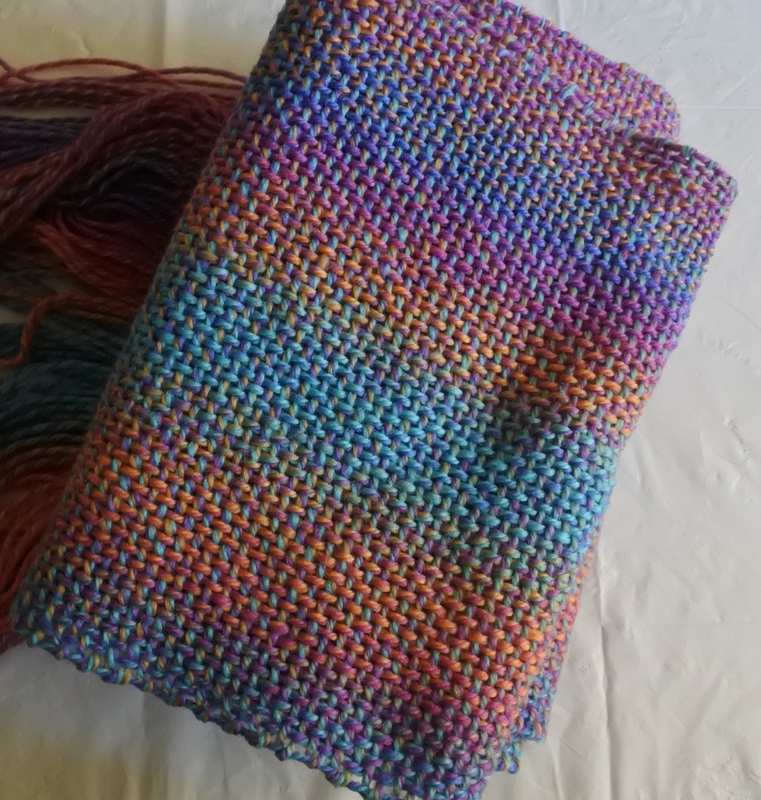 It’s a little hard to see but for this scarf I ran the thin sections of the yarn over and under the cloth so the supplementary warp is on both sides! Metal washers to the rescue! 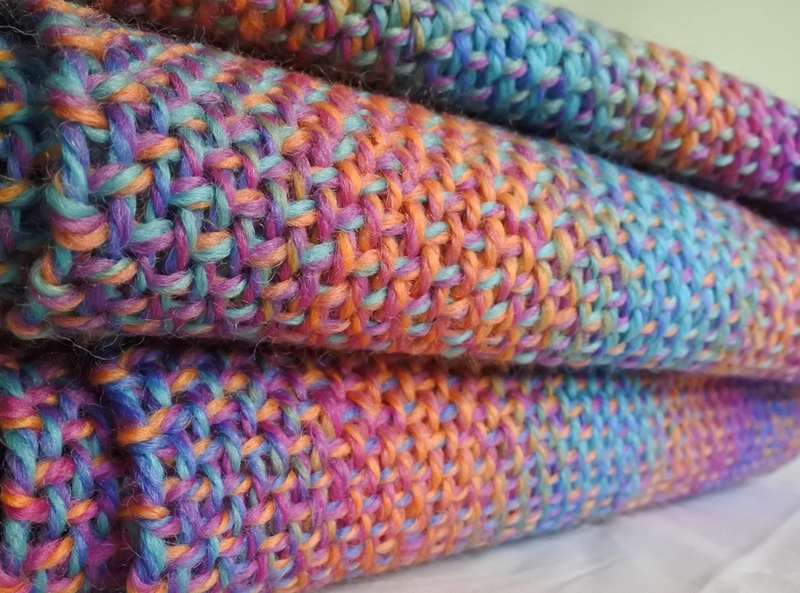 Of course if you’re using a different colour of the same yarn as the warp then you can just warp it with the rest, but the fun of this technique is mostly in the crazy yarns I think! 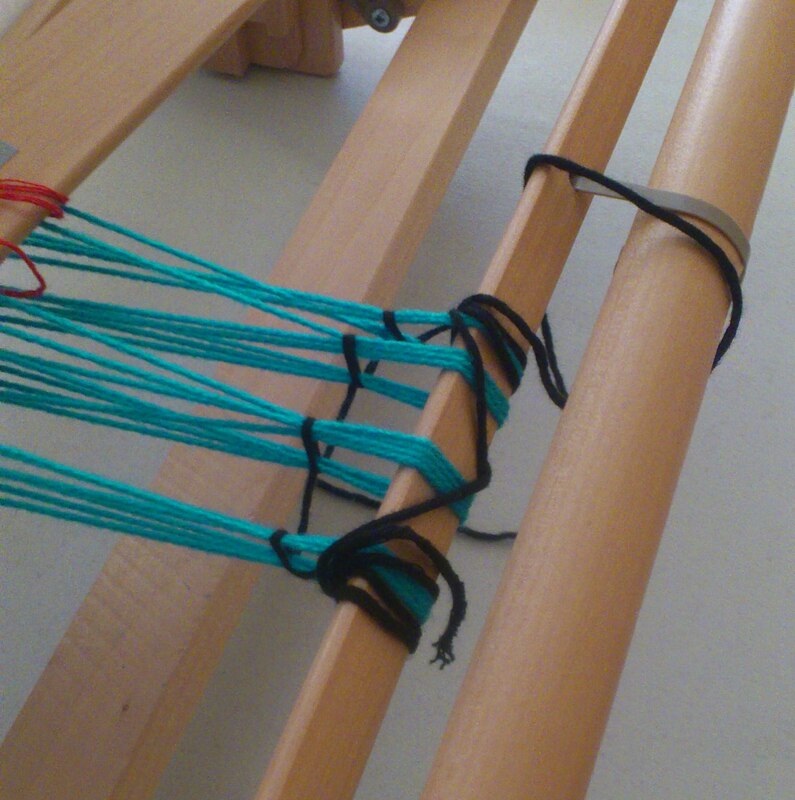 In my first project, because I was moving the warp under and over the web, I actually didn’t weight it. Instead, I pinned it to the fell line each time it crossed over/under to achieve a small amount of tension. The result of this is that the thick sections have a lovely bit of slack so they can move with the cloth. For the current project, because I’ve threaded the Noro yarn through the heddle, the weights are keeping it under an acceptable amount of tension. I do occasionally give each one a little tug (gently!) too, but obviously the Noro Silk Garden will drift/snap under not much tension at all, so I’m being careful. In this case, the Noro is also my weft and the affect I’m after is far more subtle than with the Knit College yarn. Keep an eye out for pictures of the finished project! 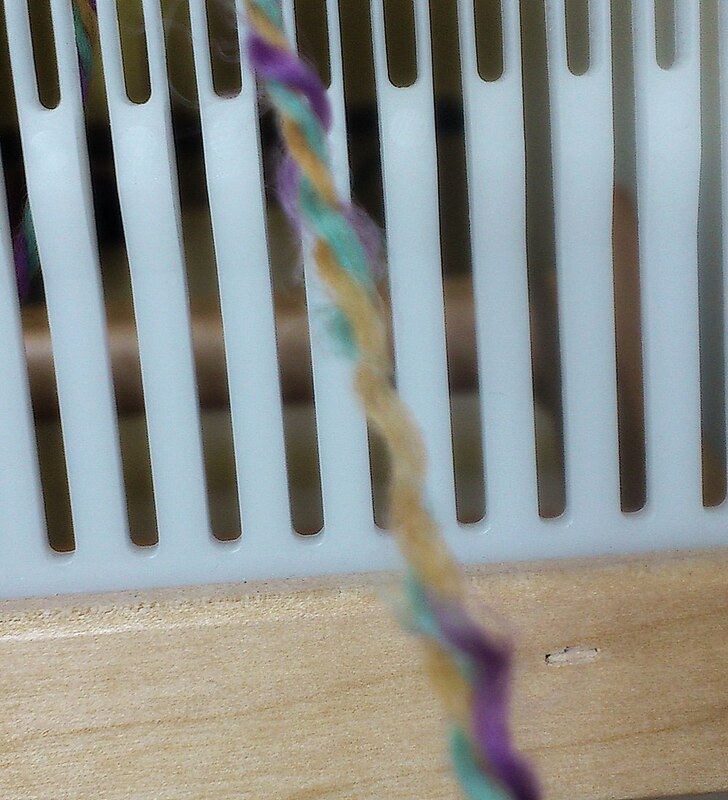 Depending on how you attach your warp to your back beam/ back warp-stick on a rigid heddle loom, you can find that when you’re close to the end of your warp the warp isn’t all nice and level. Some warp ends are higher/lower than others and this creates a messy gap which can make it hard to get a clean shed. 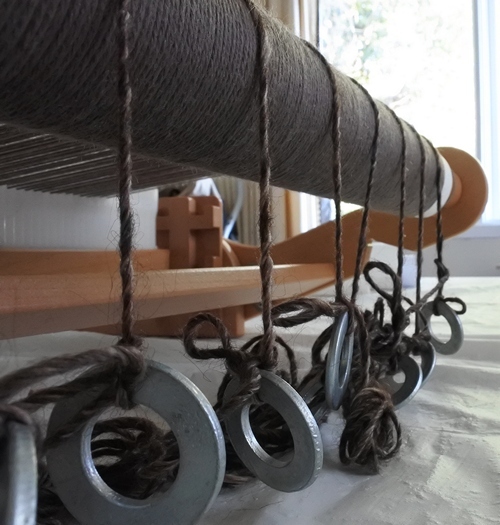 My approach when this starts to happen is to get a nice long bit of scrap yarn and, just in front of the back warp stick, wrap it around bunches of warp ends. This cinches them together and removes the gap. I find I can squeeze the very last out of the length of my warp this way. 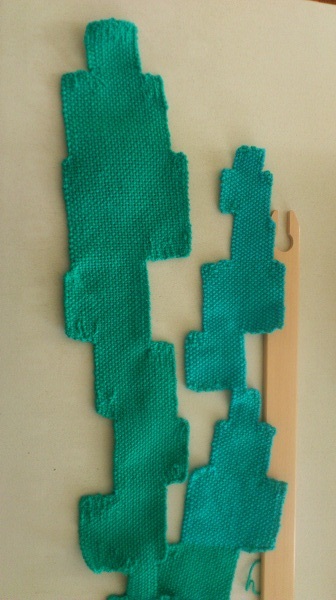 In this example I was grouping quite a few ends at a time, but I often do them in much smaller groups. 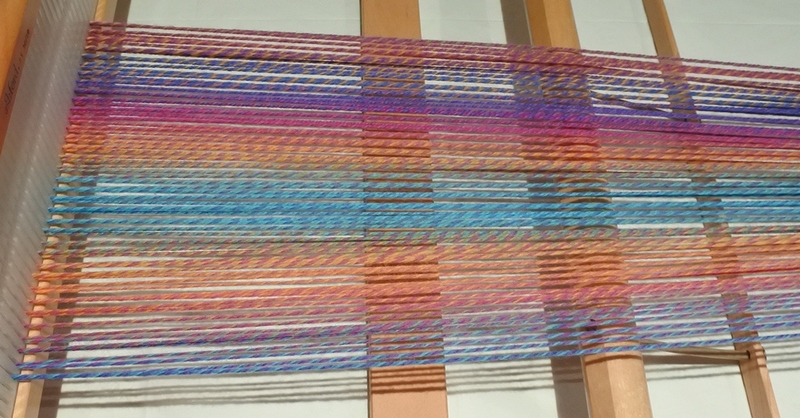 The idea was to weave a continuous piece, but not weave the whole of the warp and change the section of warp used to create off-set rectangles. Don’t get me wrong, I think it’s fine for a first experiment. It did however throw out some interesting challenges, the first of which was that you would need to graph this to make it really work. Why? Because as you wind forward onto the cloth beam, you lose track of how your “squares” are positioned. Freeform is great fun, but I think this technique you want a particular mix of balance and asymmetry to make the final piece eye pleasing. The other challenge was what to do with all those ends? 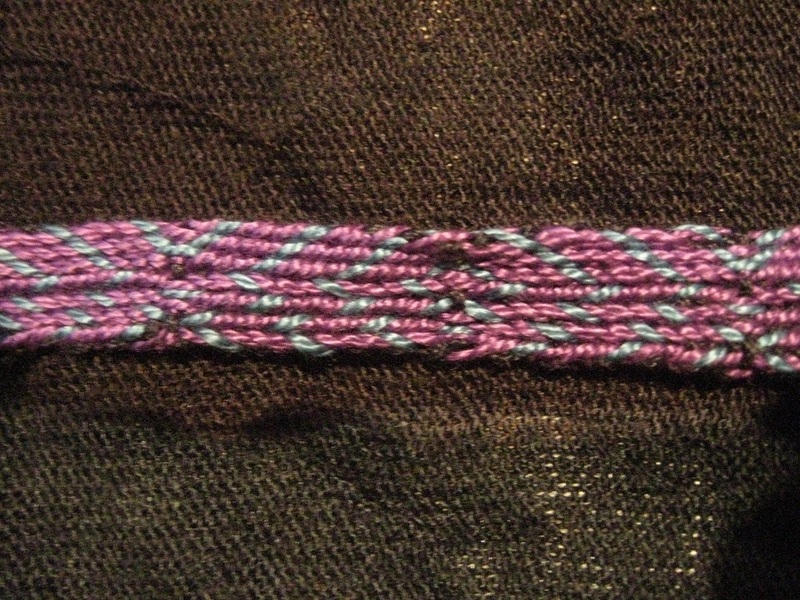 Every “square” has at least some warp ends that need handling and they aren’t always very long. You can see in the picture that many edges look like they’re suffering from some kind of termite problem (well, that’s what it makes me think of! ), but that’s the natural result of trying to sew in a looooot of ends. The ends were also largely responsible for the not-square-ness of many corners. You weave and learn!